Quite often you require an extension of "Responsible is Me" advanced filter for cards on views - in the cases when you want it to be applied to other users but yourself. The mashup (custom add-on) serves as partial workaround solution for the missing filtering capability. Typical use case for the mashup is the following. Your whole Scrum team uses the same common board. However Developers see only stories & bugs that are planned for development and are in progress now on it, while for QA Engineers the board displays only items that are coded, ready to be tested and in testing at the moment. This mashup displays additional button - Hide not Responsible - on all boards where Person is selected as a lane. When this button is pressed, only the cards which every person is responsible for are still shown. Other cards become hidden. The responsibility is calculated using workflow state of an entity, setting of responsible role of the state, and personal assignments to an entity within the role. More information can be found here: ToDo list filtered by Responsibility. The mashup can be activated by Administrators of your Targetprocess account. Install the mashup from the Mashups Library. Navigate Settings > Mashups menu item for this purpose. In the Mashup Library find the mashup named Hide Not Responsible and press Install button. After installation, reload Targetprocess page in your web browser. Request your colleagues to perform the same action if the mashup doesn't appear for them. 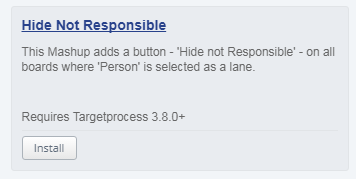 Open the board where 'Person' is selected as a lane, and press 'Hide not Responsible' button.